Imagine Backyard Living - Blue Water Pool Chemical Co. Buddy Andrews, the owner of BLUE WATER Pool Chemical Co., has partnered with his cousin, David Ghiz, previous owner of Paddock Pools (sold in 2005), and now President of Imagine Backyard Living. This store can provide you with anything you need to complete your backyard living experience. From spas, to patio furniture, to custom outdoor kitchens, fire pits, misting systems, and much more. If you want to view the store at anytime, call Buddy, and he will be happy to take you through the unique one-of-a-kind showroom. Or, schedule an appointment with Imagine Backyard Living 480-607-3529. 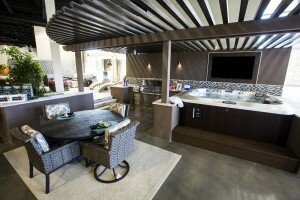 Imagine Backyard Living is the exclusive Jacuzzi Hot Tubs and Sundance Spas dealership for Arizona. Imagine Backyard Living – The essence of creating and fulfilling your backyard experience. For more information on Imagine Backyard Living, visit their website.